Doug who had previously worked for the foundry at Fremantle, came to Narrogin in 1946 and went into partnership with Jack Lee and opening up an engineering workshop, under the name of Gilbert and Lee, in Federal Street, They also had the Mortlock agency and sold the new Standard cars, This partnership continued until 1950, after which Doug moved to a another building in Gray Street and operated there until around 1972. In about 1947 Doug instigated the original Narogin Motorcycle Club, the club was not incorporated and mainly got motorcycle riders together for outings, they did hold some informal scramble events as well as speed trials on a straight stretch of road near Johnny Gibson's place. Well known publican Acky Fenn from the Corwall Hotel who supported many sports would give the club a keg of beer, which they would consume out in the bush. It was the arrival of Neil Munro in Narrogin that really instigated the official formation of the club, Neil had transferred in his employment with the Main Roads from Geraldton to Narrogin around 1964 - 1965. Neil who was a very experienced rider with the Geraldton club and who was well known through competing in rounds of the state scramble, was approached by the Harley Davidson Club to have Narrogin host the Harley Scramble, The Harley Club had lost the use of the Ropeworks track in Mosman Park because of re-development plans. 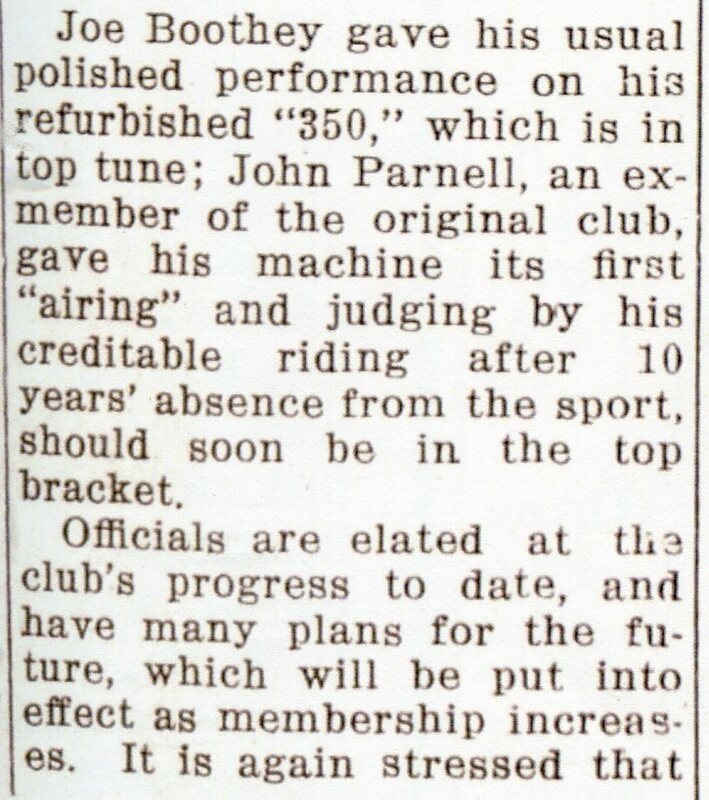 In January of 1966 a group of motorcycle enthusiasts made a move to revive the club once again, This group organised a series of organised events at the gravel pit east of town. Motorcycle events were being held around the Narrogin district in the form of picnic day runs as well as racing around the speedway, or tq track as it was often refered to, Walwalling Swimming Hole near Highbury was also a popular spot, As well as scramble events at the track that was refered to as the "Gravel Pitt". 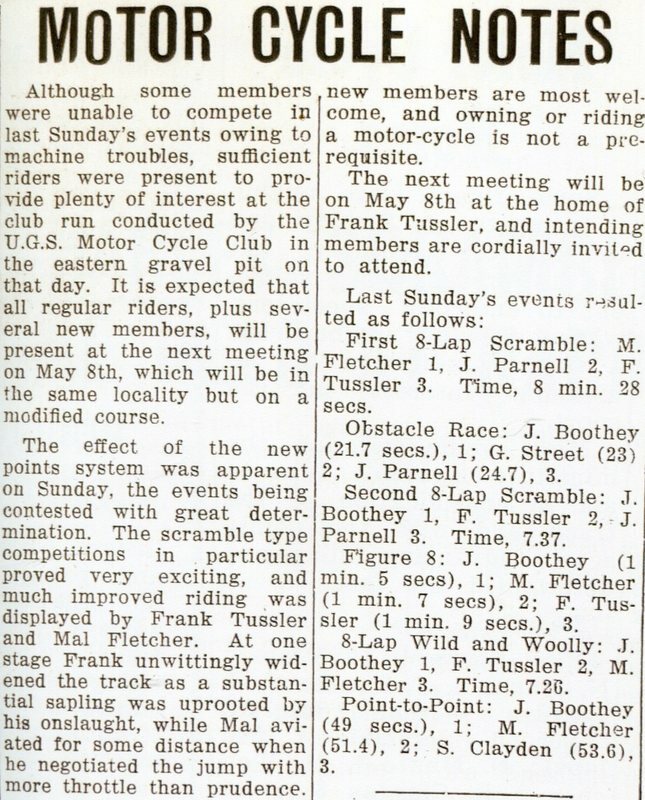 In March of 1966 after a race meeting at the Gravel Pit a club meeting was convened to get the ball rolling to incorporate the club. During this early period the Narrogin club was known as the Great Southern Motorcycle Club, The club used this venue up until later in 1966 when it shifted its operations to the Dandaloo Park circuit. George "Frank" Tussler who was born in 1937, was a shearer that worked around the Nyabing district and lived in Narrogin with his wife, Frank was a mad keen motorcyclist and was involved in racing and the inception of the club. Frank lived in Narrogin up until 1975 when his wife died, and so he moved on, Frank died in 2006 at the age of sixty nine. 1966 Gus Matherson - Robert Clayden - Graham Street - Joe Boothey - John Parnell - Frank Tussler - unknown. What remains of this scramble track is situated behind the Narrogin Speedway on the Wickepin Road, The area now is the Narrogin Gun Club.